HomePUSAPresidents of the USA – 2012 UK Tour dates! 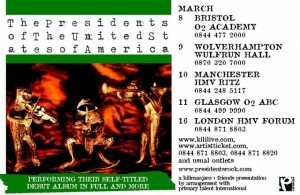 Presidents of the USA to perform their debut album completely on 2012 tour! See the 2012 PUSA Tour Page for more concert details.